Just when you thought you'd heard the last of Google's fledgling social networking platform, Google+, the company goes and completely overhauls its design. The service, announced back in 2011 with hopes to stifle the rapid growth of social media networks like Facebook and Twitter with Google's own humongous user base, is receiving the same, fresh coat of Material Design paint that Mountain View's suite of services have enjoyed since Android Lollipop 5.0 launched last year. Although Google+ hasn't made life too difficult for its social media competitors since launch, that isn't stopping the search firm from supporting the project with a little love in the form of its new, refined focus on the user community. First off, the new Google+ scales better across devices, finely-tuned to work just as well on your smartphone or tablet as it does on your desktop browser. Google notes that, at the time of writing, you'll need to opt-in to the new Google+ in order to see the visual changes. Next up, Google is front-loading a two of its most popular features, Communities and Collections, to greet you when you log onto the social networking site. 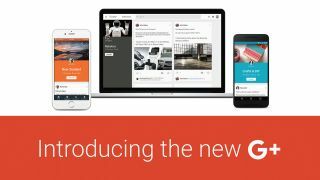 Each allows users to hop into forum-style rooms and topics where they can explore media-rich posts inside the new Google+ design. These features might not seem too unique if you're a Reddit or Imgur lurker, but this approach stands out because it puts you in direct connection with others who have similar interests. Google has a full list of updates for your browsing enjoyment. The question remains: Will this update make people care about Google+? The Material Design visual revamp is surely a step in the right direction to keeping an ever-shifting crowd, but we'll have to wait and see if users engage with it and more flock to the service. Let us know what you think about Google's move to sustain its social networking presence.